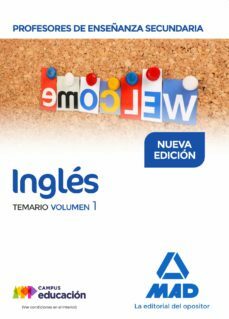 This is an updated version of the original publication containing sixty-nine topics to help post-graduate students prepare for the exam to become EFL teachers in state secondary schools in Spain. The first edition in 1997 was the result of a complex search for information when access to the Internet was technically limited and not many sources offered suitable material online. The topics were grouped in sections according to the teaching approach required to orally present them during the examination and distributed in three books. The challenge for this new edition has been just the opposite: the critical selection of available information online to best suit the main guidelines for each topic. The result is that while some of the topics are basically very similar to those that appeared in the first edition, other topics have considerably improved with new information and more examples. Apart from the specific content, changes in the structure of the examination have also made redundant the teaching approach and didactic guidelines of the first editions. The topics appear now in a linear sequence and have been distributed in two books. Book one comprises topics from one to forty-two and includes areas of knowledge such as: Language Acquisition, Grammar, Discourse, Communication and History of Language. Book two contains topics forty-three to sixty-nine and deals with areas such as Literature, History and Culture.